Hinckley says “I don’t know” six times in seven short sentences, obviously uncomfortable with the question. After stating, “I don’t know that we teach it,” Hinckley immediately stated, “I don’t know that we emphasize it”—a peculiar comment to make about a doctrine if they don’t teach it at all. Of course, one would think that the president and prophet of the LDS Church would know whether his religion teaches that God the Father was once a man like us. The only reasonable and fair way to understand Hinckley here is that his second statement was meant to clarify or qualify the first statement: it may be included in their teachings, but it isn’t something they “emphasize.” The rest of what he said is consistent with this interpretation. He claimed that it had not been discussed publicly for some time (more on this shortly). The one thing he admitted knowing was “the philosophical background behind” the doctrine. In saying that neither he nor others “know a lot about it,” Hinckley was simply saying that Mormonism doesn’t provide much in the way of details about God the Father’s life before he became a God. In saying that he didn’t “know a lot about it,” Hinckley was admitting implicitly that he did know something about it, as he had just admitted in saying that he understood the philosophy behind it. we don’t tend to teach it much in public discourse. he doesn’t know much about this topic, though he understands the philosophical underpinnings. That seems to be an accurate summary of what Hinckley said. Again, Hinckley did say that Mormons don’t talk much about God the Father’s mortal life and that they didn’t know much about it, but he never denied knowing what the doctrine is or what it means. These were outright misrepresentations by Mouw. Once again, Mouw asserted that Hinckley had stated that he didn’t understand the doctrine of God the Father having been a man and that the LDS Church didn’t talk about that doctrinal idea any more. As explained above, Mouw’s claims here are misrepresentations of what Hinckley actually said. Mouw went further here, though, and claimed that what Hinckley meant was that the doctrine that God was once a mortal man was not central to Mormon belief. On that point, Mouw was probably right as to the impression Hinckley was seeking to convey. His comments did suggest that the doctrine was on the periphery of LDS belief. Hinckley was signaling a decision on the part of the Mormon leadership to downplay the Snow couplet within the corpus of Mormon teachings about the deity, not just to outsiders, but within their own community. This suggests that contemporary Mormonism is interested in joining the broad Jewish and Christian consensus that God is ontologically different from man—or at least that Mormons today don’t want to directly contradict that consensus. The quote at the end of Mouw’s paragraph comes from an article that the Institute for Religious Research published on its website in 1997. In that article, IRR made the crucial point that in fact the LDS Church was still teaching the doctrine in question, citing as an example the 1992 edition of the LDS manual Gospel Principles.9 The 1997 edition of Gospel Principles, released sometime in the same year as Hinckley’s interview, also teaches the doctrine, even quoting Joseph Smith’s King Follett Discourse.10 While we may be glad that Mouw is reading some of IRR’s publications, it is disconcerting that he is not addressing the documentary evidence we have presented that supports our conclusions. Hinckley explicitly cited with approval both the King Follett Discourse and the Snow couplet. Hinckley explicitly affirmed the goal of attaining “godhood” as set forth by Joseph Smith and Lorenzo Snow. The fact that Hinckley gave only a partial quote of the Snow couplet does not mean he was rejecting or distancing himself from the first part. As the FairMormon page previously cited comments, “Although he did not mention the other half of President Snow’s statement (‘As man is, God once was’), it’s quite clear from the context that President Hinckley was aware of and agreed with it.”13 Although Hinckley’s focus was on the potential of humans to become gods, that potential presupposes the possibility of someone who is not a god becoming one—of which the Heavenly Father in Mormon theology is the chief example. In Mormon thought, it is because we are literal offspring of God the Father that we have the potential to become like him, as children grow up to become like their parents. This belief is not incompatible with affirming that God the Father will always be greater than his children. Finally, the LDS doctrine of eternal progression, or of humans becoming gods, does not rest on the Snow couplet alone. In fact, the primary basis for it in Mormon thought is the King Follett Discourse, one of Joseph Smith’s last sermons. It is unfortunate that Richard Mouw continues to make this mistake. At his best, he understands that what counts is not what Mormons say to non-Mormons but what they say to each other: “The test for me is not what Mormons say to me, but what they say to each other.”16 It is particularly important to base our conclusions about Mormon doctrine on what Mormon leaders teach their people. Hinckley’s controversial remarks to the media are not the appropriate place to begin in ascertaining what Mormonism teaches. 1. Richard J. Mouw, “Mormons Approaching Orthodoxy,” First Things, May 2016. 2. Robert M. Bowman Jr., “Are Mormons Approaching Orthodoxy? A Response to Richard Mouw” (Institute for Religious Research, 2016). 3. This is the full answer in the unedited transcript provided to IRR by the interviewer for Time, Richard N. Ostling, and quoted in Luke P. Wilson and Joel B. Groat, “Dodging and Dissembling Prophet?” (IRR, 1997). See David Van Biema, “Kingdom Come: Salt Lake City was just for starters,” Time, 4 Aug. 1997. 4. “Mormonism and the nature of God/Hinckley downplaying the King Follett Discourse” (FairMormon, last modified 24 March 2015, accessed 13 April 2016). 5. Richard J. Mouw, Talking with Mormons: An Invitation to Evangelicals (Grand Rapids: Eerdmans, 2012), 55, emphasis added. 6. Richard J. Mouw, in “Evangelicals and Mormons: A Conversation and Dialogue,” with Robert L. Millet, moderated by Michael Cromartie, South Beach, Miami, FL, published on Faith Angle Forum, Ethics and Public Policy Center, 7 May 2012 (emphasis added; misspelling of Hinckley’s name in the transcript corrected). 7. Richard J. Mouw, Author Events at Eerdmans Bookstore, with Robert L. Millet, 9 Jan. 2013, emphasis added. Note that Mouw corrected his earlier blatant misrepresentation about the Mormons not talking about it “at all,” but continued to assert that Hinckley claimed to have no knowledge about the doctrine. 8. Richard J. Mouw, “Evangelicals and Mormons: A Conversation and Dialogue,” with Robert L. Millet, January Series, Calvin College, 9 Jan. 2013. 10. Gospel Principles (Salt Lake City: Church of Jesus Christ of Latter-day Saints, 1997), 305. 11. That article, I should note, was written eleven years before I joined IRR’s staff. 12. Gordon B. Hinckley, “Don’t Drop the Ball,” Ensign, Nov. 1994, 46, emphasis added. 13. “Hinckley downplaying the King Follett Discourse” (FairMormon). 14. Mouw, Talking with Evangelicals, 61, paragraph break removed. 15. 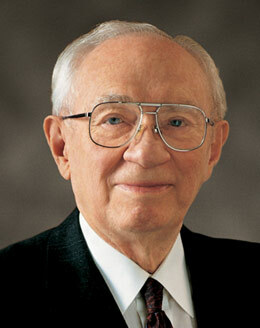 Gordon B. Hinckley, “Drawing Nearer to the Lord,” Ensign, Nov. 1997, 4–6, emphasis added. 16. Mouw, Talking with Mormons, 41.